The new version of Touch Calendar supports the following languages: English, French, German, Italian, Spanish, Korean, Japanese and Simplified Chinese. A fix for a crash affecting Android 4.0 users, and some new options for the widget. 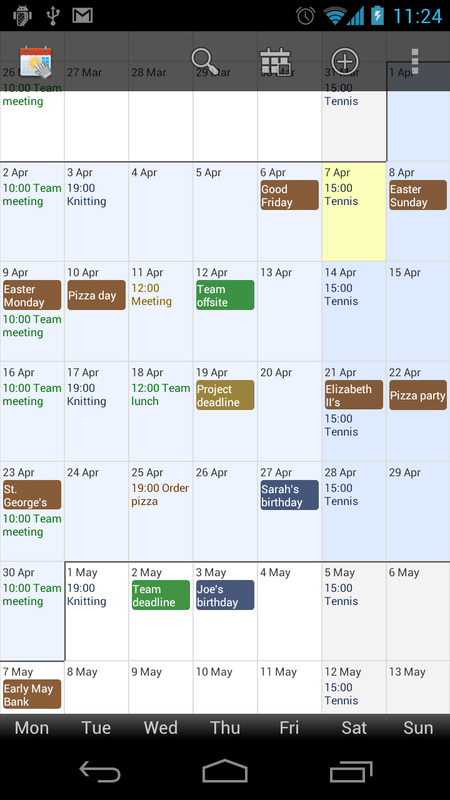 If your phone’s just been upgraded to Android 4.0 (Ice Cream Sandwich), you’ll notice a change in the way Touch Calendar looks. That’s because on ICS devices Touch Calendar supports the Android device guidelines, to give a beautiful interface that fits in with other apps on your device. You’ll see the action bar along the top of the app, and on the Galaxy Nexus or other phones with no menu button, you’ll see the menu button on the action bar in the top right, just like in other apps. The action bar also gives quick access to search, ‘go to today’ and ‘add event’ functions. Tapping the Touch Calendar icon on the left of the action bar also takes you to ‘today’, so there’s now a difference: tapping the Touch Calendar icon goes to the current date and resets the zoom level to default, whereas tapping the today icon on the right moves the date but doesn’t change the zoom level. As well as the main screen of the app, the add event and edit screens have been updated as well, to all use the Android Holo theme. This gives a fresh, modern look that will fit in with other apps that also follow the guidelines. Also had a few problems with this release so sorry to anyone who downloaded and had crashes with 1.1.16 or 1.1.17. Should all be fixed now! 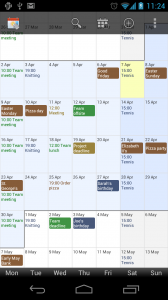 Like the new version of Touch Calendar Free, this update brings support for the Honeycomb and ICS look-and-feel with action bar support. It also has a few widget changes including the much-requested transparency option.